I'm totally loving this zebra print. If you've been on Pinterest at all, I'm sure you've seen this lovely yellow scarf. 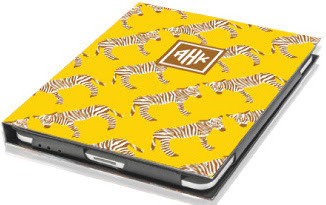 Monogram + bright colors + zebra = The perfect ipad case. It reminds me of this Scalamandre wallpaper that I have obsessed over for years. Fun Fact: Did you know this wallpaper was created in 1945 for Gino's restaurant in Manhattan? Well, now you do! If Kate Spade has it in her bathroom, you know it has to be good! I also still want this pillow so very badly. I just can't justify $160 pillows that will be used by my dog more than myself.